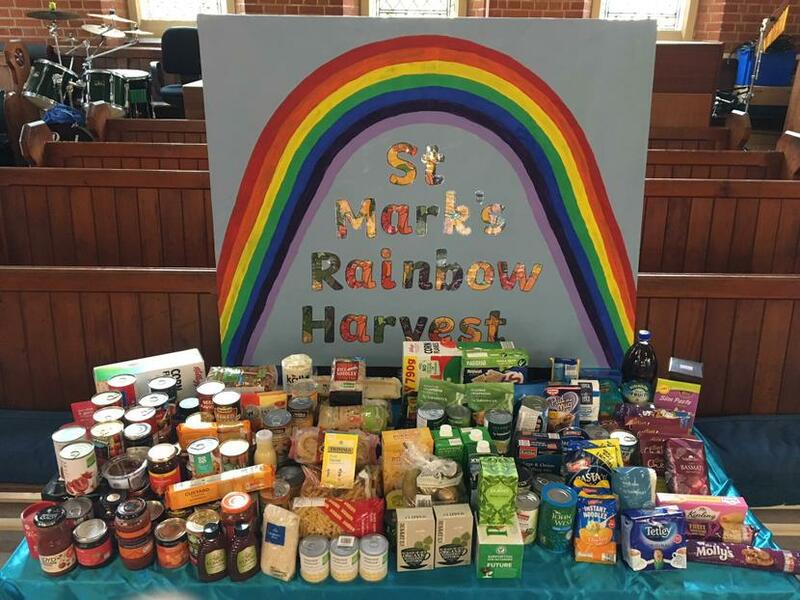 This year the Children of St Mark’s delivered a ‘Rainbow Harvest’ with our theme being colour. They reminded us of the beauty of colours of the rainbow and each Year group gave a performance about the different colours. Year R told about their favourite ‘red’ things. Year 2 recited a delightful poem about the glory of ‘yellow’. Year 3 acted out the ‘Fruits of the Spirits’ through the colour green. Year 4 told the exciting poem of Randy the Water droplet through the colour blue. Year 5 performed a fantastic rap about the colours ‘indigo and violet’. We were then all deeply moved by the Year 6 performance of ‘The Rainbow People’. It was a heartfelt story about the true value of sharing what you have with others to make a difference. We are very proud of our children and we extend our thanks to our families for their very kind Harvest donations that will be offered to the Farnborough Food bank. "We would like to thank you all, the staff and pupils and their guardians for the splendid Harvest Festival Donations that were kindly offered to us. The haul of provisions from your own Harvest from St.Mark's came to 82.8kgs. A terrific effort! All stock will be dated and stored for rotation before filling the cupboards at our FoodBank Outlets, both at Cove and Aldershot. Each and every item will go to assisting those in crisis that puts a high demand on the individual/s finances and abilities. Our ethos is "nobody should go hungry tonight". Thanks once again!" Again, we extend our gratitude to the North Camp Methodist Church for their generosity and kindness in lending us their church for our Harvest Festival.